“This bracelet has been cleansed, infused & empowered with Reiki Healing” - Love & Light x. This Healing Handmade Chakra Bracelet holds 7 natural gemstone beads on cotton cord & each bead represents & vibrates with each Chakra. The stone can be used in addition to the bracelet when extra healing is needed! It’s healing properties are known to help with anger, fear, envy, rage, sorrow & jealousy whilst bringing vitality, self-esteem, compassion, courage & ambition. “Each Rose Quartz Crystal bead & tumble stone have been cleansed, infused & empowered with Reiki Healing” - Love & Light x. This set includes a natural Rose Quartz bead anklet & a Rose Quartz tumble stone. It brings about joy, happiness & blessings. It’s healing properties are known to help with anger, fear, envy, rage, sorrow & jealousy whilst bringing vitality, self-esteem, compassion, courage & ambition. It can also help balance over sensitivity & generate the ability to nurture & care for others. “These beautiful & natural Moonstone healing crystal beads have been cleansed, infused & empowered with Reiki Healing” - Love & Light x. It can also help balance over sensitivity & generate the ability to nurture & care for others. “This beautiful & natural Moonstone healing crystal bead & tumble stone have been cleansed, infused & empowered with Reiki Healing” - Love & Light x. “This beautiful & natural Red Jasper healing crystal bracelet has been cleansed, infused & empowered with Reiki Healing” - Love & Light x. Red Jaspers healing qualities include health, immunity & prevention of illnesses. “These natural Red Jasper stones have been cleansed & blesses with Reiki Healing” - Love & Light x. Red Jaspers healing qualities include health, immunity & prevention of illnesses. Red Jasper is the stone commonly used for healing imbalances within the root / base chakra, associated with survival, health, abundance, connection to Mother Earth. It will help you get rid of your stress and anxiety because Howlite is also a powerful calming stone. WHITE HOWLITE. Howlite can balance your calcium levels and help in the proper distribution of much-need nutrients. The set is put together to coordinate colours Mix it up Silvers. 1 seed bead matt steel size 12, 1 glass sliver seed bead, size 8,1 matt silver seed beads size 8,1 silver round 3mm beads and steel silver 4mmfaceted beads with a AB coating. This stone also opens new pathways for the Kundalini energy to rise. “This beautiful & unique Serpentine bracelet has been lovingly handmade using Reiki healing energy” - Love & Light x. “All my handmade bracelets have each been lovingly handmade with Reiki healing energy” - Love & Light x. Red Garnet can be used for healing imbalances within the root / base chakra, associated with survival, health, abundance, connection to Mother Earth & moving forward in life. "Distance Bracelets" Wish Bracelets, Wish Bracelet. Enclosed is a heart sticker, so that you can seal it after you have had a quick peek. Take That - Handmade Beaded Bracelets, show your love for Take That with a beautiful Handmade Bracelet. The bracelets are made of Black glass beads with acrylic black and white letters. Elasticated seed beaded bracelet with a center Silver coloured Yin Yang which is right on tread. Matte Black Onyx with 3 Tiger Eye gemstone beads on stretch cord. 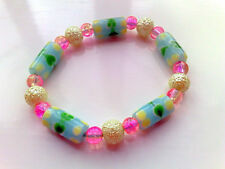 Bead diameter = 8mm Supplied with free gift pouch. Tiger's Eye is a stone of protection that is also very stabilizing and grounding. It enhances integrity, willpower, self-confidence, practicality and correct use of power. It is a stone that enhances good luck, and brings prosperity, often in the form of money. Tiger's eye is also a very protective stone which is especially protective during travel. It can also help one see clearly without illusion. Tiger's eye brings a special boost to the solar plexus chakra and to one's personal power. 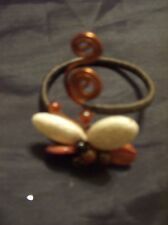 This bracelet is approximately 7" (inches) circumference and will stretch, allowing for easy on/off fit over the hand. 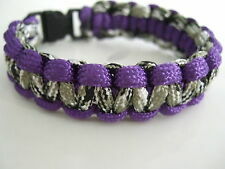 Please allow up to 10 days (at busy periods) for me to make your bracelet. Sliver double infinity knot connector/black cord adjustable slider bracelet . Dispatched with Royal Mail 2nd Class Large Letter. Bracelets made by hand in Spain. A demand is made. The thread used is 100% braided nylon. The bracelets of 7 years are considered as an amulet for protection against bad energies. It should be carried out in the left hand, since it is the receiving side of the body and the soul. HANDMADE BEADED STRETCHY BRACELET WITH PURPLE/MAGENTA CRACKLE BEADS, GREY CRACKLE BEADS & BLACK ACRYLIC BEADS, WITH A PURPLE SEA HORSE CHARM IN THE CENTRE. WILL COME PRESENTED IN A LOVELY PURPLE BUTTERFLY ORGANZA BAG. TO SEE MORE OF MY ITEMS, PLEASE LOOK AT THE REST OF MY LISTINGS OR VISIT MY FACEBOOK PAGE: WWW.FACEBOOK.COM/PRETTYBEADEDTREASURES. IF YOU BUY MORE THAN ONE ITEM, POSTAGE WILL BE COMBINED. I WILL REFUND THE POSTAGE YOU'RE OWED THROUGH PAYPAL ONCE PAYMENT IS RECEIVED. Ladies bracelet handmade elasticated beaded bracelet white and silver bead 6ins. White bead (slightly off white) = 8mm. Sliver infinity knot / heartbeat connector/black cord adjustable slider bracelet . Dispatched with Royal Mail 2nd Class Large Letter. 10mm polished A grade energised Hematite beads. Handmade HEMATITE Gemstone Power Beads Bracelet. HEMATITE is beneficial for all Zodiac signs and in particular Aries and Aquarius. Average total 22 beads for adult size (may be more or less depending on wrist size). 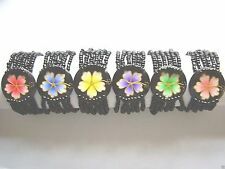 Set of 5 size 12 very small Seed beads stacking bracelets, size 12 is approx 2mm. 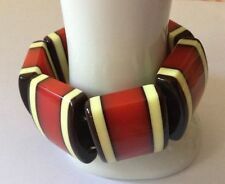 Can be wore apart and with other bracelets you may have. 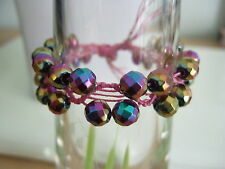 Handmade stunning elasticated beaded bracelet buy for a gift or for yourself. Thank you for looking and please come again. Chipstone Gemstone Bracelets Elasticated Bracelet 7"
Beautiful Red Crystal & Diamonte / Diamante Stretchy Bracelet - NEW!! Beautiful Black Crystal & Diamonte / Diamante Stretchy Bracelet - NEW!! Prussian blue shell pearl stretch bracelet. Approx 7.5"